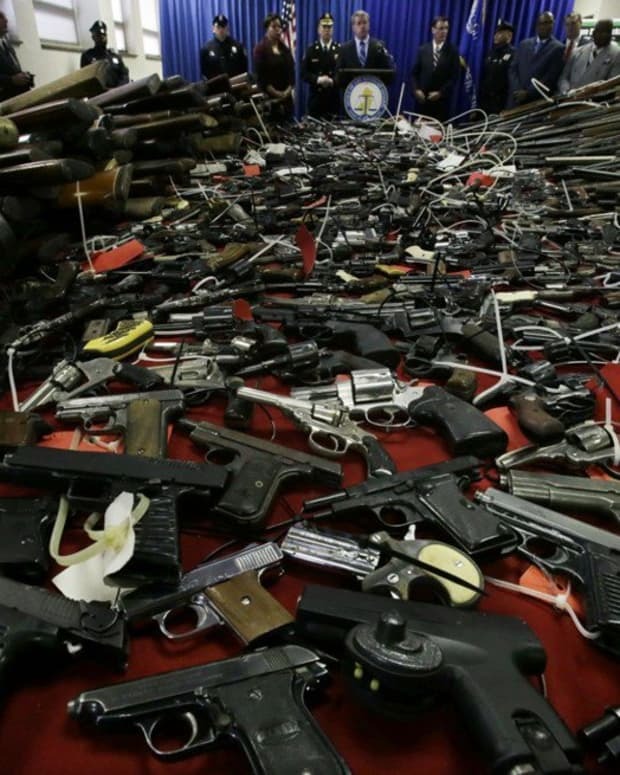 Gun buyers flocked to the Memorial Coliseum in Oregon this Saturday to purchase firearms from those who planned to turn them into police for eventual destruction. According to Oregon Live, those who returned guns at the turn-in event received a $75 gift card to Fred Meyer. Those who decided to sell their gun instead to one of the dozens lined up around the sidewalks and parking lots received a lot more. As people flocked to turn in their guns, gun enthusiasts shouted prices like auctioneers. "One-hundred fifty for the revolver sir!" Gun buyer David West shouted. "It&apos;s not too late!" Unfortunately for West, the man decided to turn over the firearm for the gift card at the Ceasefire Oregon Education Foundation turn-in. The event took place for four hours, where owners of guns could give their weapons to foundation volunteers. Portland police also handled the weapons. All guns received will eventually be destroyed. Foundation volunteer Liz Julee said, "I believe the majority of people would not show up here today if they did not want their gun removed from circulation." Some people, however, knew about the financial opportunities of selling their guns to outside buyers. David West traveled from Medford planning to purchase some quality guns from those intending to turn them in. His first purchase of the day was a Remington Nylon 66 22-caliber rifle which he purchased for $20. He resold it almost immediately to another buyer for $100. 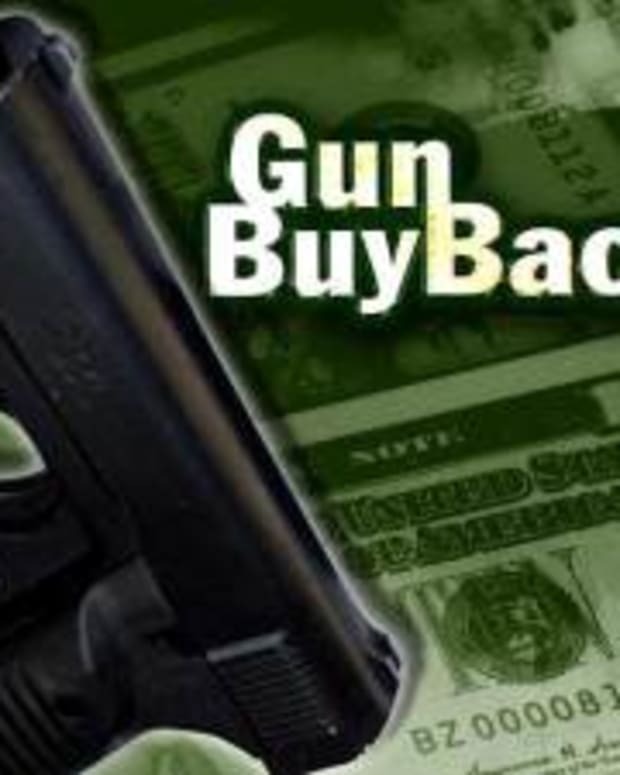 Gun buyers said they purchased the weapons mostly because they have great resale value. Others said they wanted to prevent firearms from going out of circulation. A diesel mechanic who attended the turn-in said people are likely turning in their guns because they&apos;re afraid of them. "I think they&apos;re intimidated by a firearm, they&apos;re scared of a firearm," Campbell said. "That&apos;s why they&apos;re bringing them in." Campbell also said the experience at the turn-in was disconcerting and amusing. "You see a stranger standing on the sidewalk saying, &apos;Hey, I want to buy your gun,&apos; you gotta admit--I thought it sounded kind of funny," Campbell said. Many would think the police would take issue with the gun buyers lining the sidewalks and streets, but Central Precinct Sergeant Tim Sessions said they didn&apos;t have a problem with them. "They have a right to buy guns," Sessions said. "That&apos;s in the Constitution. So that doesn&apos;t bother me a bit." He also emphasized the fact that the buyers know what they&apos;re doing and know the laws well, so are unlikely to resell to "undesirables." He explained, "that&apos;s not the case. These people know what they&apos;re doing, they know the laws. They know they&apos;d lose that right if they did sell to the undesirables." Sessions also said gang members were unlikely to attend the turn-in. "They really would like to see the gangs turn in the guns," he said, "And I tell them, &apos;Keep wishing that.&apos; But it&apos;s not going to happen." More typical sellers are those who had forgotten weapons in basements or closets and had no use for them. The turn-in event was successful, gathering 244 firearms and a crossbow. Liz Julee, the volunteer, said she could recount five instances where a family tragedy was linked to gun violence, including her mother&apos;s suicide. "So basically I do this in honor of her," Julee said.